While most of the hockey world is focused on the other two New York area NHL teams battling for the Eastern Conference title, I'm taking some time to focus on ranking the remaining Islanders that I didn't rank in my previous three entries. Once again, I'm only ranking the forwards that played in at least 20 games this past season. So players like Micheal Haley and Rhett Rakhshani will have to wait until they get more time on Long Island. 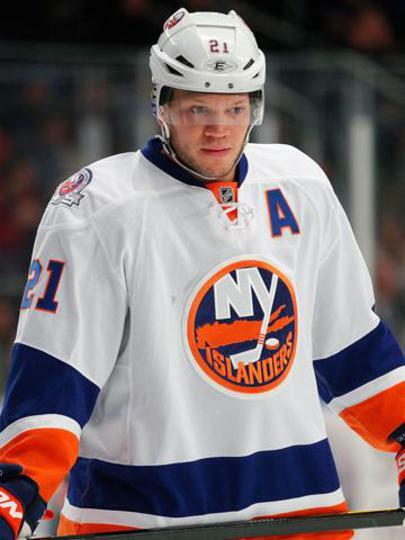 Kyle Okposo had a very interesting season. Kyle spent some of the early part of the season up in the press box as a healthy scratch and the longest streak in his career without scoring a goal. It ended with Okposo recording the highest goal total of his career. In early November with the Isles struggling to put anything in the net, coach Jack Capuano put Okposo on a the Isles top line with forwards Matt Moulson and John Tavares. They produced and Okposo found his game that had gone missing at the start of the season. Ultimately, if PA Parenteau doesn't return, Okposo might get more time playing with them. If Parenteau returns, Okposo will likely play with the same people who he has played with most of the last couple seasons, Frans Nielsen and Michael Grabner. As for Okposo's ranking, it would have been higher had he been more consistant throughout the year. He was very streaky, going through long goalless droughts and hot goal scoring streaks. If he can figure out how to go on a good streak for most of the year, he will continue to be a top six forward on the Islanders for the upcoming future. Nielsen might have been the biggest bargain for the Islanders last season. Before I go into his offensive numbers, I want to write about his defense. He usually starts his shifts facing the other team's top line in the Islanders defensive zone or on the penalty kill. In the future, don't be suprised if he is nominated for, or even wins the Selke Trophy, which is given to the best defensive forward in the NHL. The defense is also one of the main reasons the Isles signed Nielsen to a 4 year/$11 million extension February. Another thing that probably won't show up on the back of his hockey card is that he is the best NHL shootout scorer since the NHL first implemented shootouts after the lockout. Nielsen is 23/38 in shootouts in his career. That is a 60.5% success ranking. That is the highest all-time of all shooters who have taken at least 30 attempts. This stat is even more astonishing because Nielsen uses the same move for almost every attempt. Now it is known as hte "Danish Backhand of Justice." Goalies can't stop it even when they know it's coming. To top off all of this, Nielsen had the best offensive numbers of his career last season, scoring 47 points (17-30-47) while mostly playing with Michael Grabner and Kyle Okposo, and even playing on the power-play and penalty kill. With a new long term deal under his belt, Nielsen is no longer overlooked and underrated. It will be interesting to see if Nielsen can meet the lofty expectations the team has for him. At the pace he is going at, Nielsen will have a career next year. Theere is only one word that I can think of when describing Josh Bailey. Although I said this about Kyle Okposo, I feel like I need to say it again, inconsistant. This season was especially an up and down (mostly down) roller coaster. This year, Bailey played in 80 games. Yet he only got 32 points. (13-19-32) Out of those 32, 18 of them came in his last 20 games. That says two things. The first is that Bailey really finished his year strong and that this might continue into next season. Secondly, after doing the math, that means Bailey only had 14 points in his first 60 games of the seaosn. That number is just flat out awful. Bailey struggled to find the right role with this team as his linemates were constantly changing. He was a solid penalty killer and even scored three shorties this year, but for a #9 overall draft pick, he needs to get better on offense. 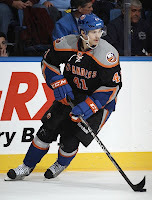 If the Isles are to contend, they need to get more offense out of Bailey. Also, he needs to find linemates and stick with them for a while so they can develop chemistry, which didn't happen last season. Bailey needs to pick up the pace or he will be picked up and dropped in Bridgeport. 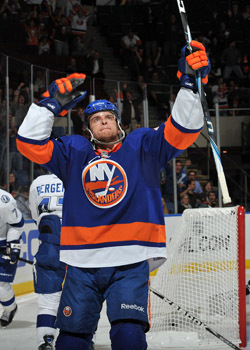 Michael Grabner came out of nowhere in the 2010-11 season to become the Isles leading goal scorer and a rookie of the year candidate. In the 2011-12 campaign, he had a reality check, and his numbers dropped significantly. Although Grabner still had the speed and ability to create chances and breakaways, for some reason, he didn't put them in the net. What's the reason behind that? I wish I could tell you. Maybe he was thinking too much, maybe he forgot to think at all. I even noticed that it seemed like he found new ways to miss every night. In any case, Grabner barely reached the 20 goal mark this year and maybe, just maybe, that is due to the fact that he took 54 less shots on goal than he did his rookie season, even though he played in two more games this year. His +/- also had a major drop, going from a +13 his rookie year to a -18 this past year. Many people, including myself, were expecting a repeat performance of Grabner's rookie season, but this year he proved that he is human. Next year will be a key year for Grabner to try to prove he is a consistant, reliable, and effective NHL forward. PA Parenteau's past season was without a dobut, the best he's had as a pro. Playing on a like with John Tavares and Matt Moulson for most of the year, Parenteau registered his highest career point totals. Although he did score two less goals than he did in 2010-11, his assists went up drastically. He had 49 helpers, which ranked him 12th in the entire NHL. When you add in his 18 goals, that gives Parenteau a career high 67 points, which was third on the team behind only his linemates. The chemistry he has with Tavaes and Moulson is almost undescribable. The three of them make one of the top scoring lines in the NHL, and they didn't change even when other lines changed throughout the season. Maybe his great year can be explained as such. Parenteau was playing in the final year of his old contract, and he wanted to send a message to Garth Snow and the Isles front office that he deserves a raise. He definitely got that message across. 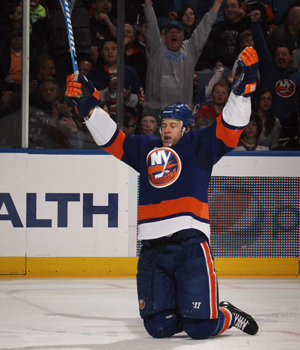 Parenteau has openly expressed that he wants to be an Islander, yet there is only one question that remains. Will Garth Snow match his monetary demands? If he does, Parenteau will continue to be a force on the Isles top line. After all these years of trying to find one, the New York Islanders have their superstar. The #1 overall pick in the 2009 draft had a breakout season, proving to the rest of the NHL that he is an elite player and a force to be reckoned with for the upcoming future. He played in his first All-Star game in January, and it probably won't be his last. He proved that he can be a team leader. (If THIS doesn't prove it, I don't know what will. )This past season, JT had new career highs in every major offensive category. Put together his 31 goals (20th in NHL) to his 50 assists (9th in NHL) and then you get 81 points (7th in NHL). That is just short of a point per game, which is phenominal for a 21 year old. There is also one other category that many people might overlook that might show why Tavares had his breakout season, shots on goal. In his rookie season of 2009-10, JT had 186 shots on goal. This past year, he fired 286 shots on net. That's exactly 100 more than he had his rookie year. The 286 shots ranked him 10th in the whole NHL. Tavares is getting more confident on the ice, so he feels better about taking shots then he might have in the previous few years. You can't forget about his defense. Capuano left JT and his linemates out for key faceoffs late in games when the Isles were protecting a late lead, and they delivered most of the time. Now that John Tavares is officially established as an elite center, it will be interesting to see how he handles the pressure that is put on him. I would expect him to have another career year as he tries to lead the Isles to the playoffs. There you go. I've ranked every single Islander. Is anybody shocked that Tavares got the highest ranking? Do you think I messed up? I'd love to hear your opinions in the comments. If you haven't looked at my previous two entries, feel free to take a look at them before you take a look at this one. Those were about the Islanders goalies and defensemen, now it's time to take a look at the Isles forwards from this past season. I'll only be ranking the forwards that played in at least 20 games this past season, so players like Casey Cizikas and Trevor Gillies won't be rated just yet. I'll be using the same 0-100 scale that I used for the defensemen here. Some Islanders had career years, others...not so much. Take a look at how the Islanders forwards fared this past season. After being sent back to the WHL after 9 NHL games in his rookie season, the Islanders wanted to keep 19 year old Niederreiter with the big club his season. To put it lightly, Nino's first full season in the NHL didn't even come close to matching anyone's expectations. Looking back on it, the Islanders would probably wish they sent him back to Portland again after 9 games. His ranking is low because he was an offensive threat in every league he played in so far besides the NHL. For a player that played in 55 games, Nino's numbers are just dreadful. He scored only one goal, and that was his only point of the season. His -29 in the +/- category doesn't help his cause. Also, he did spend a lot of time playing with Marty Reasoner and Jay Pandolfo, who aren't offensive threats. I'd expect him to play in Bridgeport for a while in the near future, as when players have played there, they come up and really help the team. Nino's NHL future looks bright, but just be patient, because it will take a few seasons. The Isles didn't make too many free agent signings before the 2011-12 season. However, one of the moves they did make was to sign the veteran centerman Reasoner to a two year contract. To put it lightly, his numbers were just miserable in his first year on Long Island. In 2010-11 with the Panthers, Reasoner had 32 points (14-18-32) while playing in all 82 games, and even had a +2 ranking. This year, Reasoner only played in 61 games, was a healthy scratch for plenty of the ones he missed, and didn't score a goal until the final week of the season. This season was the worst year of his career stastically (1-5-6), a -25 ranking was 8 worse than any of his previous career lows in the +/- category. He wasn't the Zenon Konopka type guy the Islanders were looking for when they signed him. Next year will be a pivotal year for Reasoner because if he can't rebound from this past season, then I can't think of an NHL team that has a need for a 35 year old has-been forward. 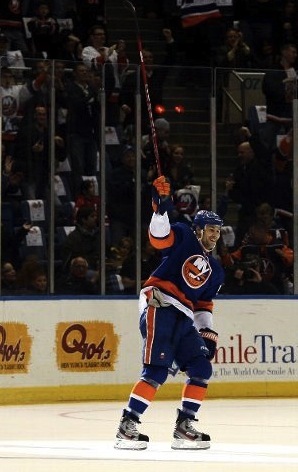 After 13 years with the New Jersey Devils, the Islanders agreed to give the veteran one more shot at the NHL. Pandolfo didn't even have a contract until the week before Opening Night. Forgetting his numbers for a minute, Pandolfo does deserve credit for making it back to the NHL and being nominated for the Bill Masterton trophy. This award is given to a player who shows qualities of perseverence, sportsmanship, and dedication to hockey. He put his heart and soul into every game this season, and even though I don't think the Isles will bring him back, I believe they made the right move signing Pandolfo. He was a valuable veteran leader for a team of young guys, a great penatly killer, and even moved to center from wing for a while when it was necessary. I won't go into his numbers as his ranking should give away his numbers for you. (They weren't good.) Whether or not Pandolfo plays again is a mystery, but we can thank him for this past season's hard work and dedication. Out of all the prospects that made their NHL debuts with the Islanders this past season, I think David Ullstrom was the best. From the first game he came up, he immediatley fit into the Isles system. He wasn't afraid to drive to the net, unlike other players who would sit back and wait for the play to develop in front of them. Ullstrom made the plays and played like he'd been in the NHL for years. A mid-season concussion may have hurt his development, but he still showed why he could be a good NHL forward in the years to come. 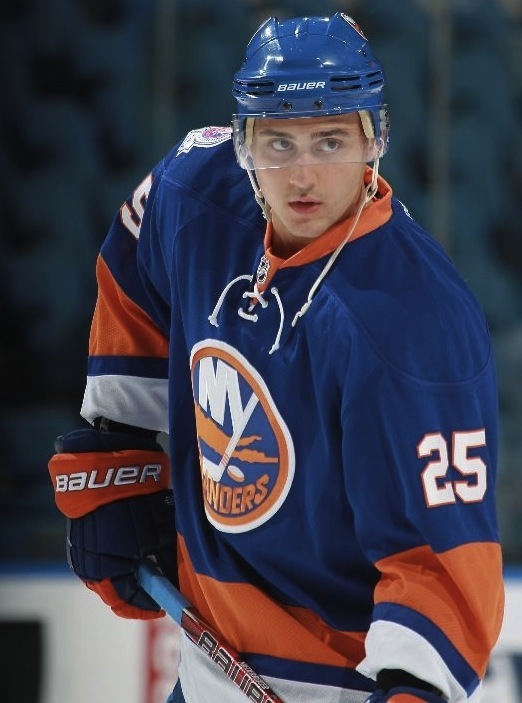 He only played in 29 games, yet he registered 8 points (4-4-8), and helped the Isles powerplay get more opportunities. I would expect Ullstrom to get more than 29 games in the NHL next year, and I really think that he will make a significant impact on the ever-maturing Islanders. Over the past three seasons, there has been no Islander that has been as consistant as Matt Moulson. He has never, not even one time, missed a game for the Islanders, playing in all 82 for each of the past three seasons, not missing one single game. Moulson has also been the Islanders most consistant goal scorer, scoring at least 30 goals in each of those three seasons, culminating with his 36 goal performance last season, ranking him 10th in the entire NHL. He was even a +1 in the +/- category for the season, which is nothing short of spectacular on a team that allowed 52 more goals than they scored. At the current pace Moulson is at, he should be in like for around 80 points next season if everything goes according to plan. Objective #1 would have to be to sign PA Parenteau, but we'll get to him later. 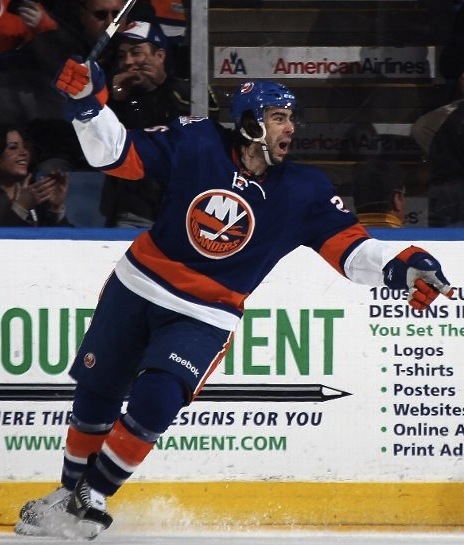 Last season, Matt Moulson was the best Islander not named John Tavares. He is a premier goal scorer and he proved that he can keep up the pace at an elite level. For Moulson, the sky is the limit. On a separate note, he is a finalist for the Lady Byng Trophy. This is awareded to the player that exhibits great sportsmanship and gentlemanly conduct along with a high standard of playing ability. With only six penalty minutes over the whole season, I wouldn't be too suprised if Moulson wins the award. He deserves it. Matt Moulson will be a force to be reckoned with for the next few seasons. This season, I think Matt Martin would have to be one of the most improved Isladners. The first major stat that needs to be brought up when talking about Martin is hits. This past season, Martin had 374 hits, 81 more than anyone else in the league. Divide that by the 80 games he played in, and that gives him 4.6 hits per game, which is a very impressive number. He is the biggest physical threat in the NHL, and if he can countinue to do this next season, he will be a very successful pro. Add 14 points (7-7-14) to the mix and you get a solid NHL player. His offense has improved from the previous season, and if it continues to improve, he'll be a consistant and valuable player and physical threat for these Islanders, who don't have any big threats besides Martin. I was very pleased with Martin's game last season, and I can't wait to see what he brings in the years to come. That's it for the first half of the forwards. I'll do the other forwards in a separate entry when I can. What do you think of these ratings? I'd love to hear your opinions in the comments section.